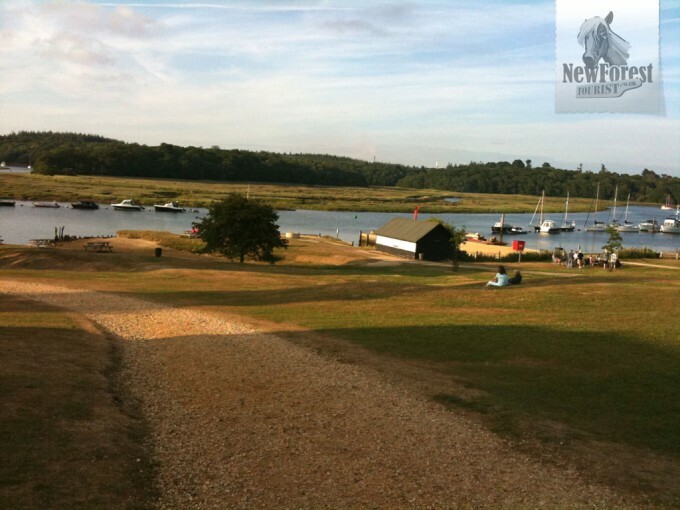 Walk Start / Walk Finish: Beaulieu Village to Buckler’s Hard and back to Beaulieu. 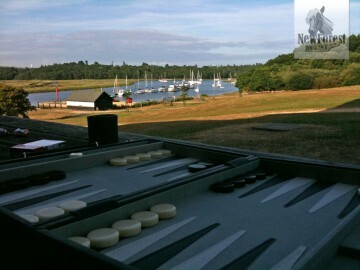 Parking: Beaulieu Village, NFDC Pay & Display Car Park. 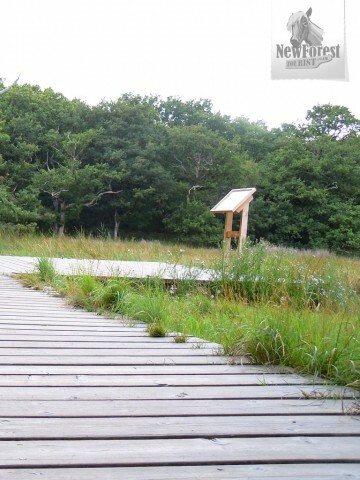 Defining Features: The walk merges with the eastern bank of Beaulieu River which defines the walk. Bucklers Hard is a fascinating 18th Century ship building village with museum, hotel/pub and cafe. Pros: A great dog walking route with no main roads nearby. Glimpses of lovely river vistas combined with fields and woodland. The pub in Buckler’s Hard greases the wheels for the walk back. There is the option to take a riverside path or a more direct gravel track; the former being much more picturesque. 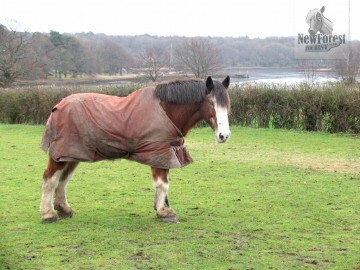 Cons: The route can be very busy and the riverside walk is particularly muddy in wet weather. Beaulieu is a charming village whose recorded history began in the early 13th Century with the foundation of the Cistercian Abbey, the ruins of which can still be seen within the grounds of the famous Motor Museum. 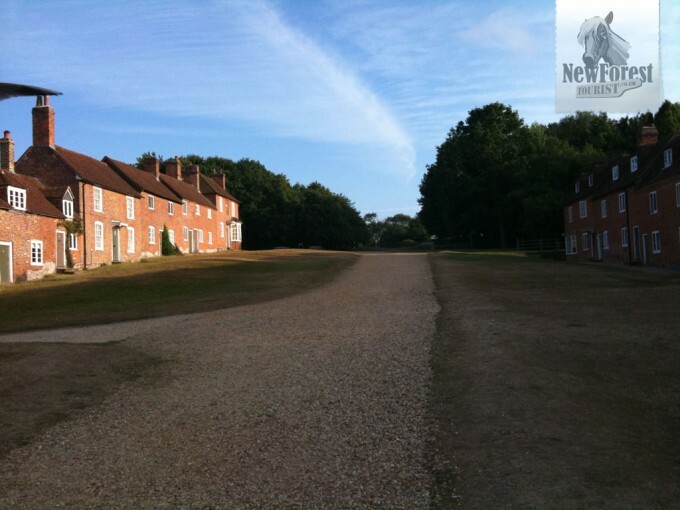 Some of the village buildings date back to the 17th Century, and this is where the New Forest Tourist begins his walk towards Bucklers Hard. The destination is an 18th Century ship building village where some of Nelson’s Trafalgar fleet were built, notably Agamemnon, after which the local boatyard is named. These Lavatories are dedicated to the relief of travellers and the comfort of the parishioners of Beaulieu. Built by the Beaulieu Estate with assistance from Hampshire County Council and New Forest District Council in Nineteen Hundred and Ninety Nine. Feeling suitably uplifted, he heads for the village high street, passing tea rooms and the village shop, both sporting ornate hanging signs containing the familiar three red diamond shapes common to properties, gates, fences, signs and other features in this part of the world. These diamonds are taken from the Montagu Coat of Arms and remind visitors and residents that they are gazing upon the property of the Beaulieu Estate. Opposite the shop is a small cut; one which would be easily missed if not for the (diamond shaped) sign pointing towards the ‘Footpath to Buckler’s Hard’, two miles in length. Walking up here through a wooden gate (with diamond shaped spikes at the top), the New Forest Tourist passes between ancient red brick houses along a gravel pathway which winds past a primary school and small field to the right. Passing through the larger gate at the end of the path our traveller looks to his left to see a track leading to the Montagu Arms Hotel. He moves to the right and shortly left thereafter through a smaller gate and onto the first lengthy section of the walk. Next to this small gate in the summer there are sometimes punnets of strawberries left out for passers-by to purchase on an honour system; but not today. It’s not the season. To the left and right of the often busy gravel track are fields of horses, some in a paddock containing jumps and other obstacles, and some running freely or grazing in a field. 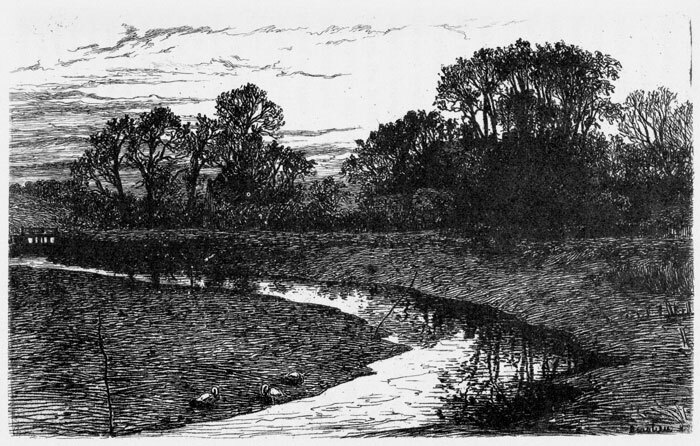 In the distance to the left Beaulieu River is clearly visible, although this far up-river; and at low tide; it’s little more than a muddy expanse traversed by a trickling stream (below is an Etching by Heywood Sumner, dated 1882). Pressing on (and ignoring the small sewage treatment plant on the left) the New Forest Tourist descends eventually into a gully and has to tread very carefully alongside the muddy puddles left by the rain. In the summer this is dry as a bone, but it can become quite an obstacle in the wet. 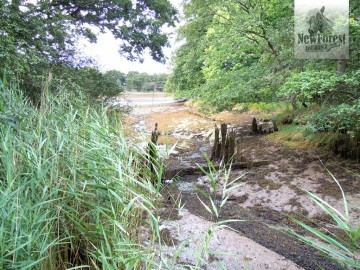 On the right is thick woodland and tall grass, but on the left he sees the interesting skeletal remains of an ancient dock sticking defiantly out of the mud. Up a small rise and the rambler emerges from the gully into a large field with a well-worn track leading all the way along its western edge. The walker remembers many a ball lost by his dog in this long, tangled grass when his son wasn’t paying attention, and he always keeps one eye on the field as he passes, hoping to retrieve one of them. He’s never found one yet. There’s not much else to see here; trees line the length of the field and the river has fallen largely out of sight, although the occasional glimpse is possible through breaks in the foliage. At the end of the field is a large red brick house on the left; this is the old brick and tile works of Bailey’s Hard, another (lesser known) shipbuilding location. A left turn here would take him to a huge brick kiln that supplied the brick works, but today’s goal is to the right. So bearing right, the traveller very quickly comes to a left turn which presents him with a very long, wide gravel track leading straight through the woods, all the way to Agamemnon Boatyard, our next waypoint. Before setting off though, our Tourist is stopped in his tracks as he looks bemusedly through the trees to the right at a tall, bright red fence, completely out of place amongst the greens and browns of the surrounding woodland. 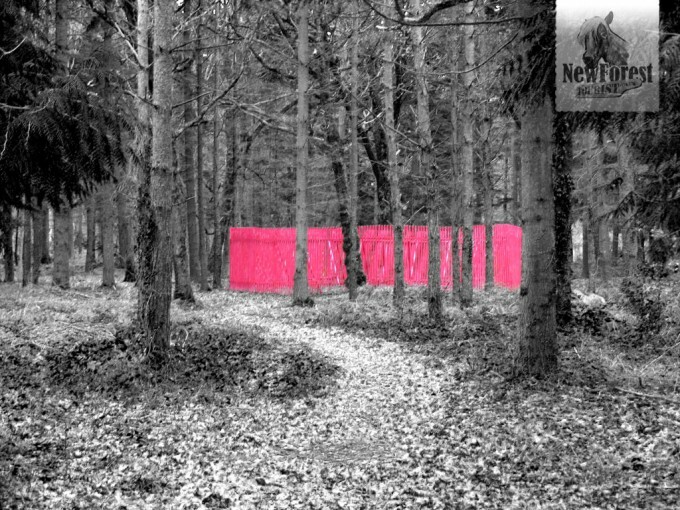 A small sign (warning its readers not to trespass into the woods) informs him that this is a sculpture called ‘Fence’ by artist Phyllida Barlow, installed by ArtSway. Slightly relieved (at first he took it for an ill-advised electrical substation) he presses on. To the left he passes a few houses buried in the woods set on stilts, tastefully integrated with their surroundings, and before long is presented with a choice. 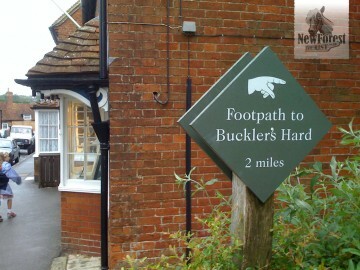 He can either proceed all the way to Buckler’s Hard on the gravel track, or can take the first of two riverside walk detours. 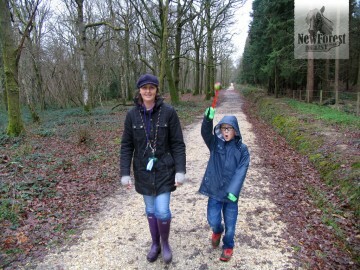 These sections of the walk are much more picturesque, although can be very muddy in the wet. Since his walking boots are already tarnished with the mud from the earlier gully, the riverside walk is the route of choice, and he heads into the woods to the left. Before long the river presents itself in all its glory, and the boardwalks here and there make the going a little easier, if somewhat slippery. Some of the houses on the banks opposite are spectacular and are hugely varied in style and age, as are the boats moored at intervals up the winding river. Occasionally the New Forest Tourist comes across illustrated information boards which educate walkers one the delights of the local wildlife and landscape. A few steep rises, large tree roots and stumbles later, our traveller comes across the second riverside section of the walk. He can either rejoin the easier gravel track or press on through the woods. The woods it is. This turns out to be a good decision, as the most picturesque views lie this way. Eventually the path narrows and falls into line beside the aforementioned Agamemnon Boatyard where yachts both old and young balance on their keels, impossibly balanced by a few strategically positioned logs. Behind the dilapidated looking boatshed lie huge masts and tangled rigging, and beyond this the path meets the gravel track, depositing walkers out onto the small access road leading to the yard. Straight across the road a smaller gravel path continues, leading the New Forest Tourist finally along the riverside, much busier with boats and water-related activity now, and past the old Bath House on the right where an earlier Montagu bathed in salt water in an attempt to improve his health. In the summer an ice cream kiosk is open at the end of the path, but our thirsy traveller forsakes this (it’s closed anyway) for the more appealing pint that awaits him at the Master Builders Hotel around the next corner. Suddenly he realises that he’s in the heart of the 18th Century Shipbuilding industry. To the left are yet more skeletal remains of huge docks where monstrous fighting ships were once built. Up to the right is the village itself, rising up a purposefully steep grassy incline, lined with cottages left and right. To the immediate right is the large garden and buildings of the Master Builders, beyond which nestles a tiny chapel, still used today and open to visitors. Other houses are still privately occupied as the traveller is reminded when an elderly chap emerges from his cottage with a fishing rod. Looking over he smiles. “Just off to catch my dinner” he call by way of explanation as he trots down to the riverside. 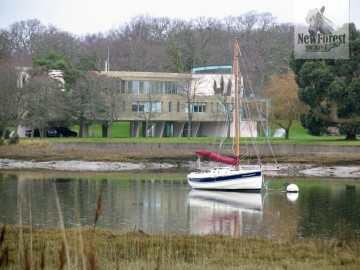 Two or three houses at the top left of the building line are occupied by the Buckler’s Hard Museum, well worth a look. For now, however, it’s into the pub for a spot of lunch before the walk back.